In our last post, we explained phlebitis, when a vein in the superficial vein system becomes inflamed or swollen. In this post we talk about prevention. If you’re interested in learning more about the topic of phlebitis, you can read about it in our current issue of Vein Health News. Do you have other questions? Give us a call, or email us, at the Vein Healthcare Center. Phlebitis happens when a vein in the superficial vein system becomes inflamed and swollen. (It is also referred to as superficial phlebitis.) Spontaneous phlebitis happens when there is a sudden onset of vein inflammation. Three out of 10 patients may develop spontaneous phlebitis after endovenous laser ablation (EVLA) therapy, but it is very preventable, especially if patients follow the post-procedure guidelines closely. Post-operative requirements include wearing prescribed graduated compression stockings and walking at least 30 minutes a day. If a patient does experience pain or swelling, he or she should apply heat to the area (NEVER ice), elevate the legs, and take a non-steroidal anti-inflammatory drug, such as ibuprofen or naproxen. In our next post we will talk about how to prevent phlebitis. 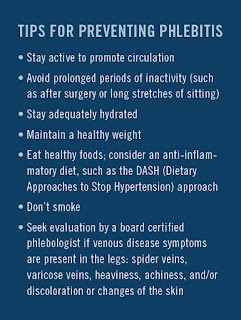 Contact us at the Vein Healthcare Center if you have any questions about phlebitis or would like to schedule an appointment. How “bad” are your veins? There are many levels of vein disease, and it is progressive. Without intervention, the severity of symptoms will increase and complications could arise that can have a serious impact on a person's overall health. In order to have a standard way to talk about vein problems, a group of experts created a classification system known as C.E.A.P., which stands for Clinical, Etiology, Anatomy, and Pathophysiology. The “C” in C.E.A.P. stands for the clinical severity rating of a patient’s veins and is the most significant in physician-to-physician communication. For patients, recognizing what C.E.A.P. classification they are in may help them to decide if and when to seek treatment. 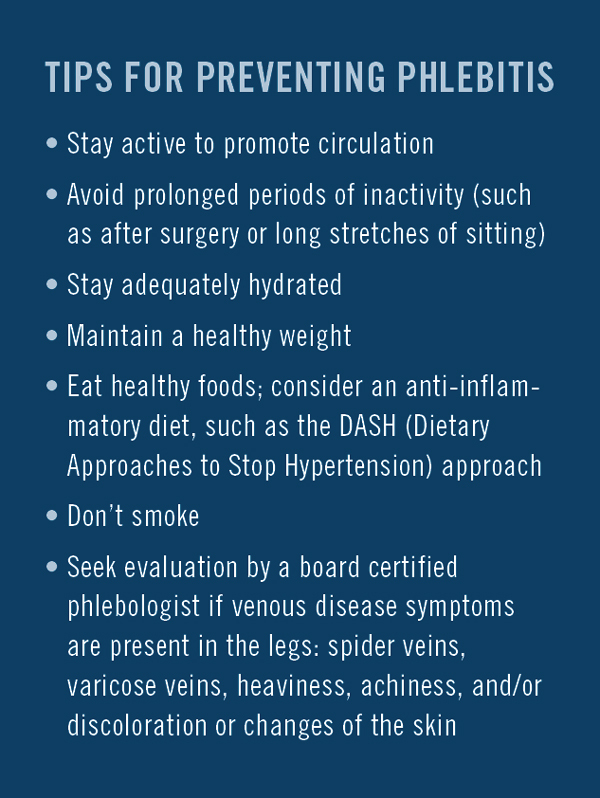 If you recognize any symptoms from the chart above, or if you have any questions about veins at all, contact us at the Vein Healthcare Center. 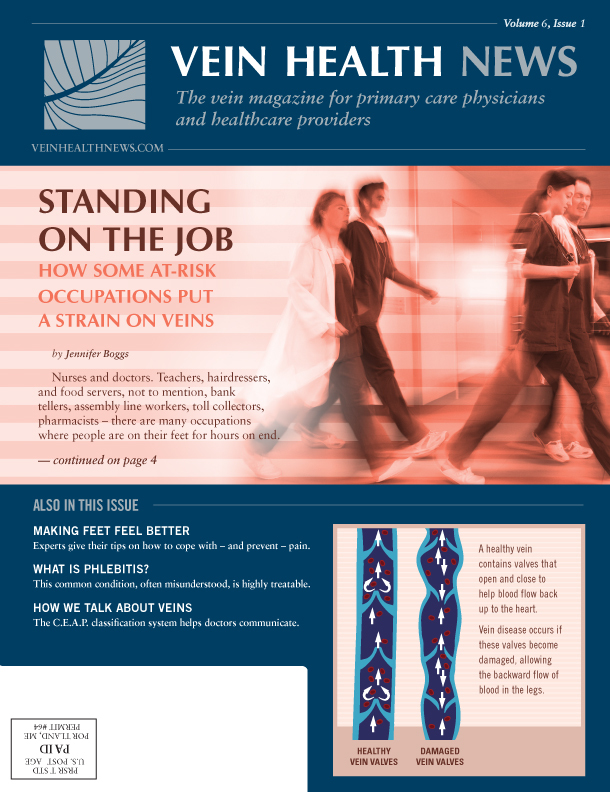 In our latest issue of Vein Health News, we look at the risks of being on your feet all day at work, as well as the role that veins may play in causing leg pain or discomfort after prolonged standing. The article explains the symptoms that indicate that leg pain may be due to vein disorders— symptoms that are often mistaken for something else. Of course, the article also explores modes of treatment and prevention. We offer tips from experts in podiatry, pedorthics, compression, and even a nail technician. Read on to find out more about what you can do to take care of your feet so that they can keep you healthy and moving forward! 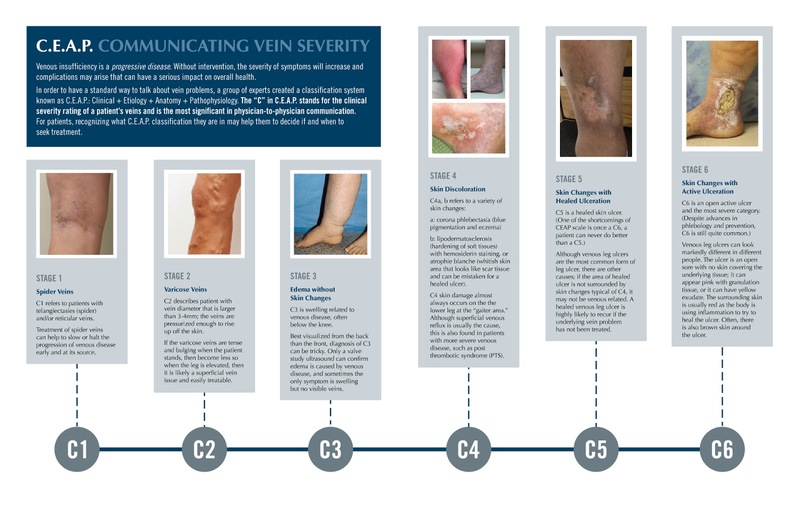 To learn more about this and other current topics in vein healthcare, click here. And if you’d like to take the next step in your vein health, click here. We are close to releasing the latest issue of Vein Health News. In the process, we've interviewed several healthcare professionals who are on their feet all day; they're also patients of VHC! “The customer service and the environment that the Vein Center provides are pretty phenomenal. There are recliners in the waiting room so you can kick back and elevate your legs. The music is great. The rooms are comfortable. To see more of what our patients are saying, click here, or read their stories here from our booklet Perspectives. August 21 is Senior Citizens Day, a U.S. observance established in honor of older adults who have made positive contributions in their communities. The day is also a time to bring awareness of social and health issues that affect senior citizens – like veins! Venous insufficiency occurs when healthy veins become damaged and allow the backward flow of blood into the lower extremities. This pooling of blood can lead to a feeling of heaviness, aching, and can cause skin changes, such as spider veins or a brown, woody appearance of the lower legs. Seniors’ veins respond differently to everyday stress compared to that of a younger person’s because vein walls are primarily made of collagen. As the body ages, a decrease in the production of collagen causes the veins to become more brittle and the valves more likely to fail, especially in the superficial veins. Thus, there is a higher incidence of varicose veins in the elderly population. Additionally, the skin begins to lose its elasticity and doesn’t respond to stress the way it once did. And because skin is the “end organ” of venous disease, ulcers can occur as a result of damaged veins. Some seniors might think that “vein stripping” is the only option. While it was the go-to procedure for many years, treatment of venous disease today is vastly different. Breakthroughs in phlebology and new approaches to treatment involve less time and less pain, and they are overwhelmingly successful over the long term when performed by an experienced specialist. The risk-benefit ratio makes treatment an ideal option for seniors. 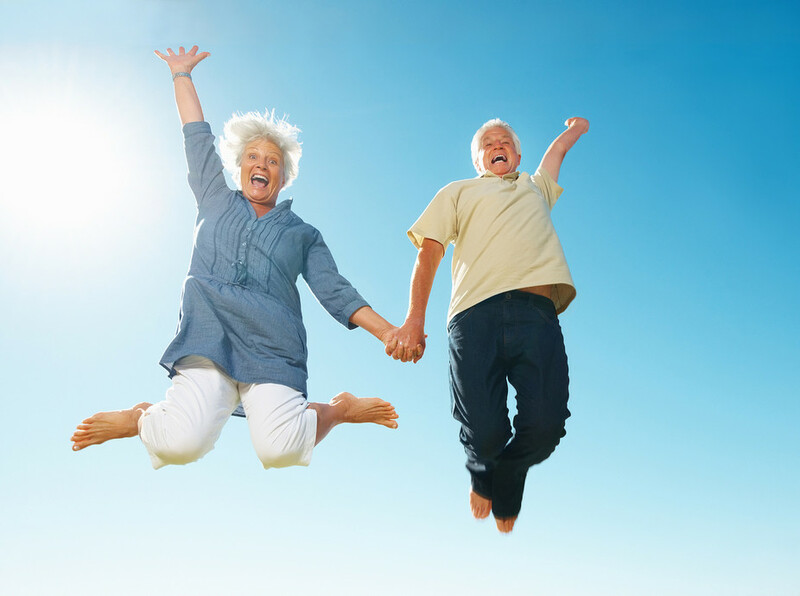 Although seniors have a 50% greater chance of suffering from vein disease, they have the same success with modern treatment options as anyone else. Get to know Dr. Cindy Asbjornsen a little bit better -- and hear some trustworthy, easy-to-understand advice. Why sore legs and varicose veins are NOT a normal sign of aging. To learn about this and more, click here to listen. And if you think you might have vein disease, schedule an appointment for a full evaluation of your vein health. Earlier this spring, our own Dr. Cindy Asbjornsen spoke with health reporter Diane Atwood on her podcast on the Catching Health blog. Their topics of conversation were far ranging, everything from how a clot in the deep vein system could possibly cause a stroke, to why blood appears blue in the veins. Dr. Asbjornsen also explains why vein treatment is NOT a one-size-fits-all proposition. And she talks about how anyone can get deep vein thrombosis -- even someone playing a video game (for many hours in a row). Who knew talking about veins could be so interesting? This isn't the first time Dr. Asbjornsen has appeared on Catching Health. She wrote a guest post on Catching Health about when you should ask your doctor about your vein problems. We hope you'll give the Catching Health podcast a listen! Click here to learn more about Dr. Asbjornsen and her practice the Vein Healthcare Center. year's theme is "Year of the Healthy Nurse." To celebrate and support nurses everywhere, we offer some healthy leg tips for nurses who are on their feet all day. 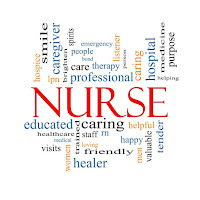 Did you know that varicose veins can be an occupational hazard for nurses? One tried and true way to reduce the effects of vein disease -- and in some cases, prevent symptoms -- is graduated compression. Please note that so-called "support hose" does not have to be ugly! Not today, with the many styles and colors that are available. Another remedy for aching legs is to elevate them periodically and at the end of the day. This post explains how to properly elevate legs. Lastly, nurses should remember to care for their feet. Here are some tips from the blog RN Central. 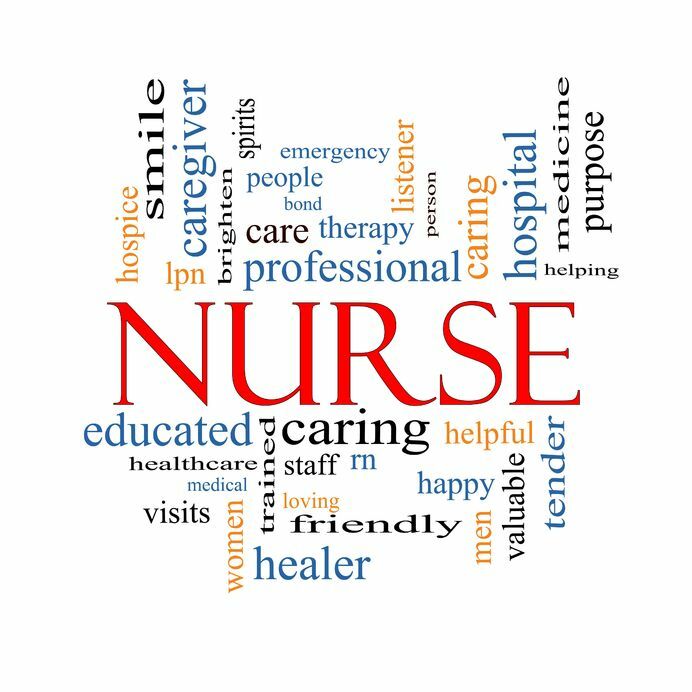 Happy National Nurses Week to all of the nurses out there. Thank you for all you do! Visit the Vein Healthcare Center in South Portland, Maine, or learn more about Dr. Cindy Asbjornsen. In our last two posts, we looked at the problem of leg pain in athletes, and how veins and exercise can possibly affect each other. If vein problems keep someone from doing activities that aggravate his or her vein symptoms, then choosing alternate activities is one way to cope. 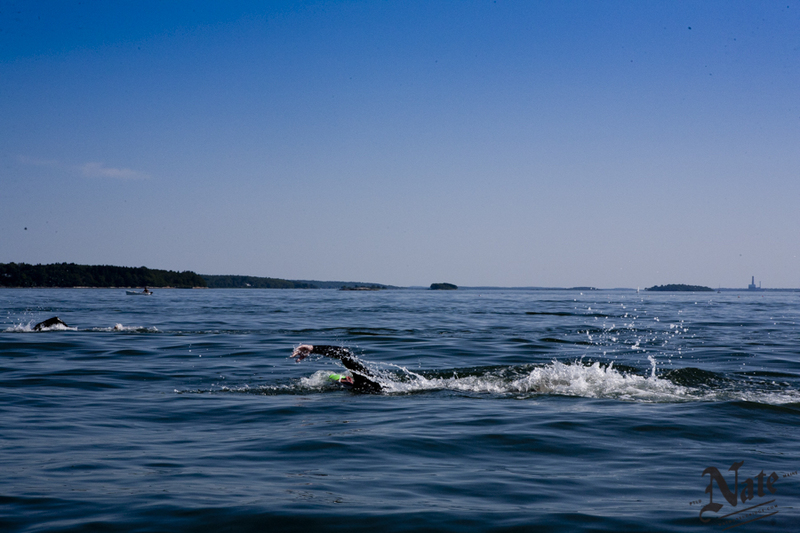 Some people may find that swimming, for example, does not produce the same discomfort that running does. Athletes can live with the problem, but they don’t have to. There are so many options for treatment so that people can continue doing their favorite sports or whatever activity they're passionate about. They might even see an improvement in their performance. Modern treatments have excellent initial and long-term success rates when performed by an experienced phlebologist (vein specialist). Endovenous approaches are minimally invasive treatments used to address specific large varicose veins in the legs. Endovenous ablation (EVLA) is considered the gold standard in the treatment of venous symptoms, with success rates between 90% and 98% after five years. It has largely replaced previous, more invasive standards of care, such as vein stripping. Another option for treatment is sclerotherapy, performed either with ultrasound-guidance, or with a light-assist, which seals the vein wall of small varicose veins allowing them to fade away. 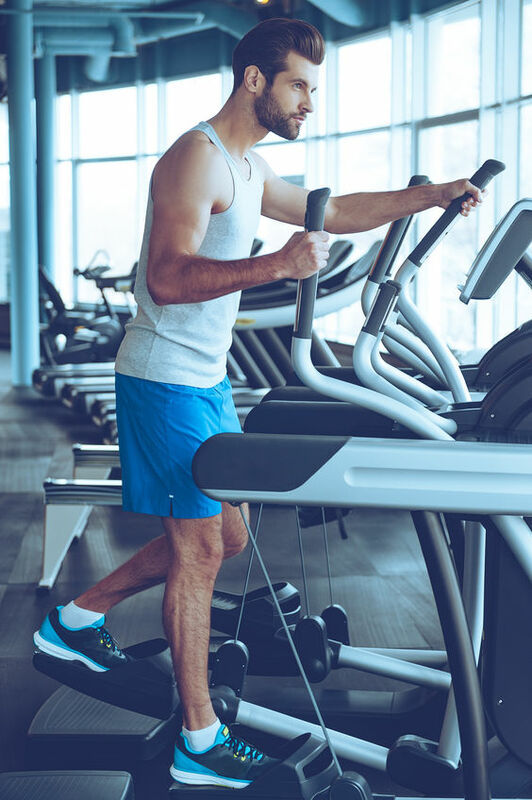 With both EVLA and sclerotherapy, patients can walk the day of the procedure and return to normal activity, including moderate exercise, within a few days. The key to safe, effective vein treatment is to consult with a board certified vein specialist who can evaluate the entire venous system so that poorly functioning veins can be treated at the source. 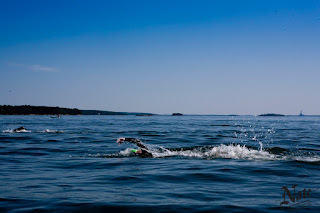 In our last post we began discussing how physically active people experiencing leg pain are possibly experiencing the effects of vein insufficiency. In this post we take a closer look. During exercise your muscles require more oxygen, so veins dilate to increase the volume of blood flowing through the circulatory system—but if your veins are not working properly, that means more blood can pool in your legs. On the other hand, exercise is beneficial from a venous standpoint because anything that improves the function of the foot and calf muscle pumps to get the blood back up to the heart is good. 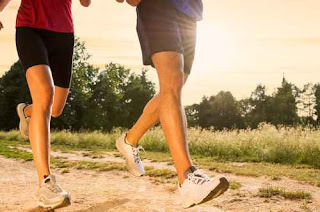 Walking is the best exercise for improving the muscle-pump function, especially following vein treatment. 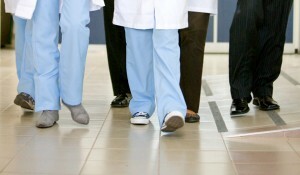 Although walking can help manage the symptoms, it does not prevent vein problems. Neither does exercise cause vein problems, except in extreme cases. Physical activities that require your legs to support heavier weight over prolonged periods of time, such as weightlifting or backpacking can put someone at increased risk for developing venous issues. Repeated exposure to increased intra-abdominal pressure, or pressure that is transmitted to lower extremities, can cause the normal system of valves and veins to weaken over time and become incompetent. Repetitive motion sports such as endurance running, cycling and tennis can also put a lot of stress on your leg veins and over time may overcome a normal venous system. In general, exercise (and working out the muscle pumps) is not detrimental for the vast majority of athletes who are participating in a more typical spectrum of activity. In fact, maximizing the efficiency of that system is beneficial. Depending on each individual’s degree of vein disease, he or she may become more symptomatic because the foot pump no longer counters the vein insufficiency. One person’s level of activity, for instance, may be associated with the progression of vein disease if they have some pre-existing risk factors, such as age or family history. While exercise can influence vein dysfunction, it doesn’t necessarily prevent it or cause it. But can poorly performing veins affect athletic performance? The short answer is yes. If the venous system is not working correctly, then the “extra” de-oxygenated blood (and blood waste products like lactate) can cause discomfort, cramping, fatigue, or other conditions that diminish performance. Even if legs feel great during training, vein issues can also cause legs to hurt after exertion and slow your recovery. In our next post about athletes, exercise, and veins, we’ll turn to treatments to fix the problem. And be sure to visit the Vein Healthcare Center in South Portland, Maine to learn more about your options for treatment. Physical activity, leg pain…and veins? Many athletes, professionals and amateurs alike, experience some kind of leg pain at one time or another, whether from the mechanics of pounding movement on a hard surface, or keeping their legs in the same position for extended periods. Rarely do they attribute the discomfort to a dysfunction in their venous (veins) system. But not all aching legs are simply due to physical activity, or even the effects of aging. It may actually be vein insufficiency that’s causing those symptoms and not that five-mile run. The first thing to understand that leg pain in general is not normal. If your legs hurt after exercise, you should find out why. Some of the symptoms of vein disease are obvious: visible blue- or purple-colored “spider veins,” bulging varicose veins, or even open wounds (leg ulcers) on the leg or ankle. Other symptoms are much more subtle. In addition to achiness and swelling, sensations like an itching or tingling in the legs may be an indication of vein insufficiency. Leg cramps after long periods of inactivity, or while lying in bed at night, is another possible symptom. Some people may experience no symptoms at all—and some merely accept them as an unavoidable byproduct of physical fitness. You can be in great shape and still have a vein disease that’s developing. In our next post, we’ll look at how exercise impacts veins (and vice versa). If you wonder whether vein issues are affecting your physical performance, feel free to call the Vein Healthcare Center with any questions. Sometimes vein disease is unmistakable. Large, bulging varicose veins are a sure sign, as are bluish spider veins. But sometimes vein issues are harder to detect. The 65-year-old woman in the picture to the right sought help because of veins in her right leg, but in her initial evaluation it became apparent through skilled ultrasound mapping that both legs were affected. Even she didn’t realize the disease was actually worse in her left leg than her right. Other symptoms that may indicate vein problems are heaviness or aching in the legs. Swelling, throbbing, cramping, or burning sensations in the leg are other signs, as are restless legs. If you think you might be suffering from one or more symptoms of vein disease, ask yourself these 12 questions to find out more. 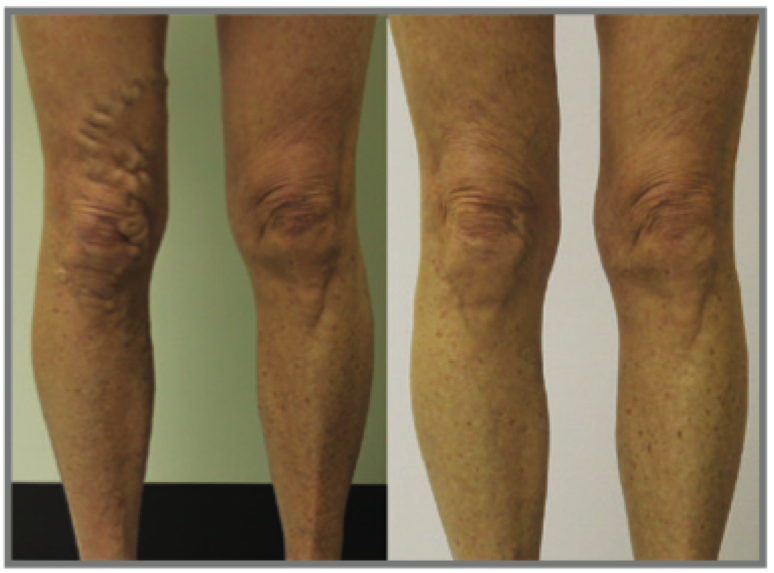 As for the patient in the picture, she had EVLA treatment on both legs, followed by ultrasound-guided sclerotherapy. Both of her legs – and her quality of life – have distinctly improved. Can I get vein treatment if I’m on blood thinners or chronic pain medication? Yes, it is possible to be treated for venous issues when taking either blood thinners or chronic pain medications. In fact, for people who take these types of medications, treating their veins is not only possible, but can even be advantageous. Blood thinners should not be an issue for someone receiving vein treatment, although those patients may be more prone to post-op bruising. However, blood thinners can be a relative contraindication – reason to withhold a certain medical treatment due to possible harm – in some cases. Your board-certified vein specialist should discuss with you if that is a potential issue. As for chronic pain medications, this should have no bearing at all on vein procedures. In many cases, patients who are prescribed pain medication for leg pain are able to discontinue taking their chronic pain medications after their venous issues have been resolved. The standard protocol at the VeinHealthcare Center is to offer patients a muscle relaxant before treatment – not because the procedure itself is painful, but because the time spent lying on the exam table may cause a strain on their neck or back. Every patient is different in this regard, and we offer pillows, bolts, blankets and hot packs to make the experience as comfortable as possible, whether the patient opts for pain medication or not. 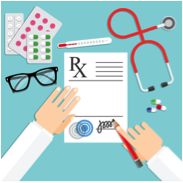 Of course, patients should always tell their physician and care team about any medications that he or she is taking, no matter what the medical treatment, including vein treatment. Before we explain what tumescent anesthesia is, let’s talk about when it would be used in vein care. Endovenous thermal ablation (using laser or radio frequency) is considered the gold standard in treatment of the great and small saphenous veins, two veins that are often the source of varicose veins in the lower leg. Endovenous laser ablation (EVLA) uses laser energy to create an intense localized thermal reaction in the incompetent vein. The thermal energy causes vein to seal shut, stopping the healthy blood flow from entering the damaged vein. This keeps the blood flowing toward the heart, not allowing it to change directions and return to the feet. The body will reabsorb the damaged and treated vein, forcing the blood to be diverted to healthy veins in the leg. EVLA is an outpatient, minimally invasive procedure performed with local anesthetic. Part of the treatment involves tumescent anesthesia, a technique in which a high volume of a dilute local anesthetic is infiltrated around the vein. 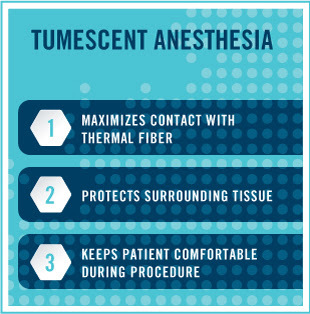 Tumescent anesthesia serves three purposes during thermal ablation. First, the fluid causes the vein walls to collapse around the thermal fiber maximizing contact. Second, the fluid creates an insulating ring around the vein and thermal energy source. This protects all surrounding tissues, including nerves and muscles, thus stopping any type of collateral damage. The third function is as an anesthetic, keeping the patient comfortable during the procedure. The introduction of tumescent anesthesia into the body should not be painful but can be when administered by some physicians. Thus, before any vein treatment, consult with a board certified phlebologist who can provide a full understanding of all aspects of the procedure. 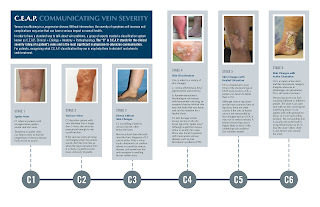 To learn more about this and other current topics in vein healthcare, click here. And if you’re interested in a free subscription to Vein Health News, just click here.